Detailed Description: Rittal Enclosure internal thermostat in light gray color is ideal for controlling fan-and-filter units, heaters and heat exchangers. It can also be used as a signal generator for monitoring the enclosure internal temperature. It 71 mm x 33.5 mm x 71 mm. It has an operating voltage of 24 Volts/48 - 60 Volts/24 VDC/48 - 60 VDC/single-phase 115/230 Volts. By using a terminal strip it can save time with a screw connection from the outside. It has heating category 5 - 3 and cooling category 5 - 4 contact load. 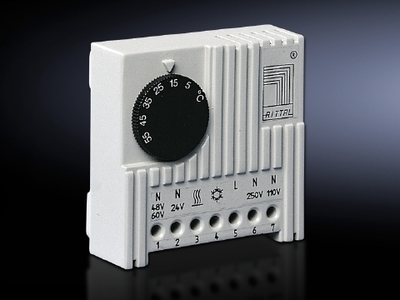 Thermostat can be flexibility mount on a vertical/horizontal 35 mm support rail to EN 50 022 and can be snapped into the TS/SE enclosure section or on the mounting plate using the supplied adaptor. It has a temperature rating of 5 to 60 deg C. It has single-pole changeover contact as a quick-break contact. 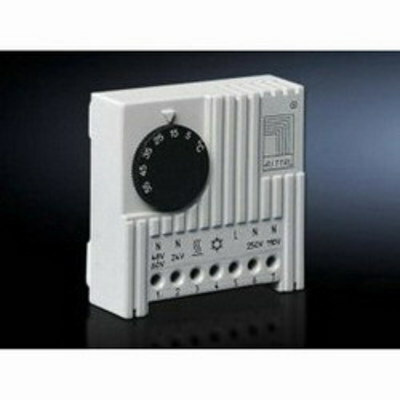 It has a bi-metal controller that works as a temperature-sensitive element with thermal feedback. It is ideal for industrial applications.